I am grateful to Dr. Adam Deville for pointing out the following scholarly liturgical study, which I am certain will be of interest to some of our readers. The Presanctified Liturgy, a communion service attached to vespers, is an office peculiar to the period of Great Lent in the Byzantine liturgical tradition. It is the ambition of this study to trace the origins, the evolution and history of the Presanctified Liturgy in the Byzantine liturgical tradition. The method of comparative liturgy and structural analysis of liturgical units is followed. The book presents a thorough investigation of sources from the early Church that could point to the origins of Presanctified Liturgy, and examines the occurrence of the Presanctified Liturgy in the other Christian traditions. 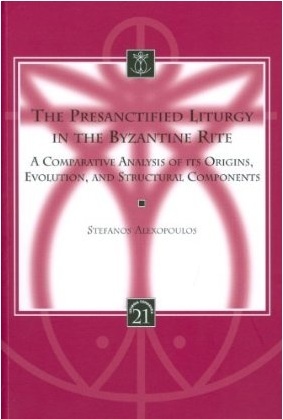 Heavily drawing upon the manuscript tradition it examines in depth the text of the Presanctified Liturgy itself, tracing the evolution of its structural components throughout history. The author argues that three dynamics have been behind the evolution and growth of the Presanctified Liturgy: imitation, conservatism, and differentiation.